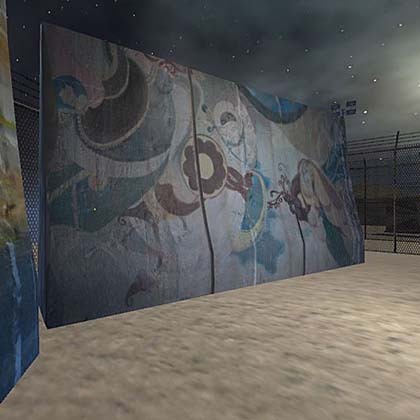 Ghosts of Camp X is a VR experience (Vive and Gear VR) set in an abandoned US detention center (fictionalized) in Iraq. Ghosts of Iraqi detainees and American soldiers roam the grounds, long after US troops have left the country. 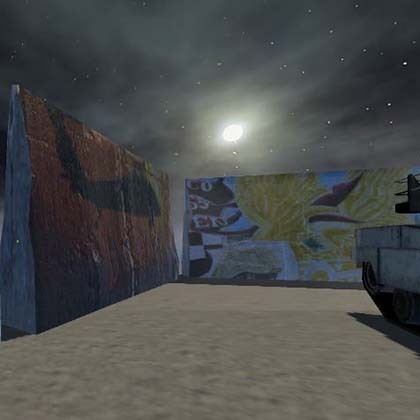 While rubble pocks the pathways, the barriers and barracks’ walls are covered with actual murals painted by detainees and GIs. 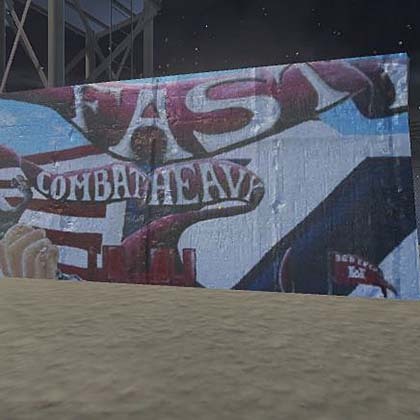 Ghosts of Camp X was presented at Virtual Reality Lab’s Demo Day, sponsored by Hearst Technology, in 2016. Technologies used: Maya, Mudbox, Motionbuilder, Fuse, Unity 3D, Photoshop, Premiere. In “Ghosts of Camp X,” take a journey through the detainee sector (Iraq side) or the GI sector (American side) of the camp and press nose-to-nose with a ghost. Move in various directions by swiping the Gear VR touchpad. Ghosts are “clickable.” Once your gaze comes into contact with an apparition, the reticle in your sight-line changes shape. 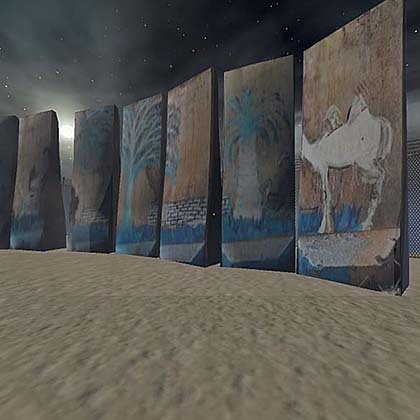 Tap the touchpad (“click”) to view either a 2D video (embedded in the CG environment) or a 360 video (scene transition). 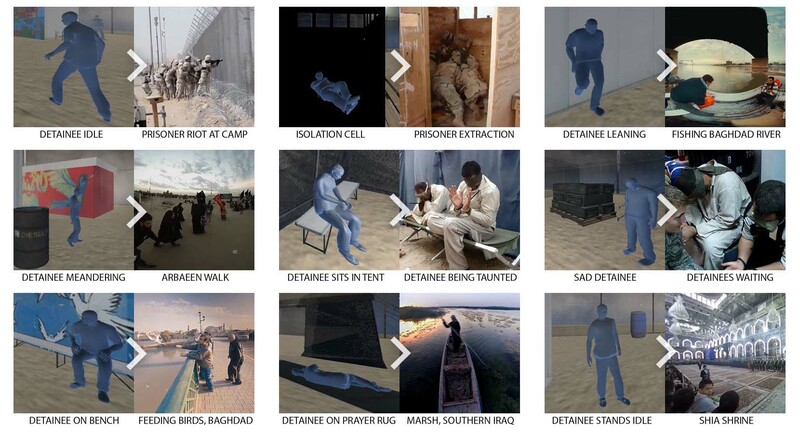 These found videos present real-life experiences by detainees and soldiers in Iraq. While some films reveal life inside a US detention center, others give you a peek into life outside the camp, such as fishing on the Tigris river, feeding birds in Baghdad or visiting the Hajj in Mecca. 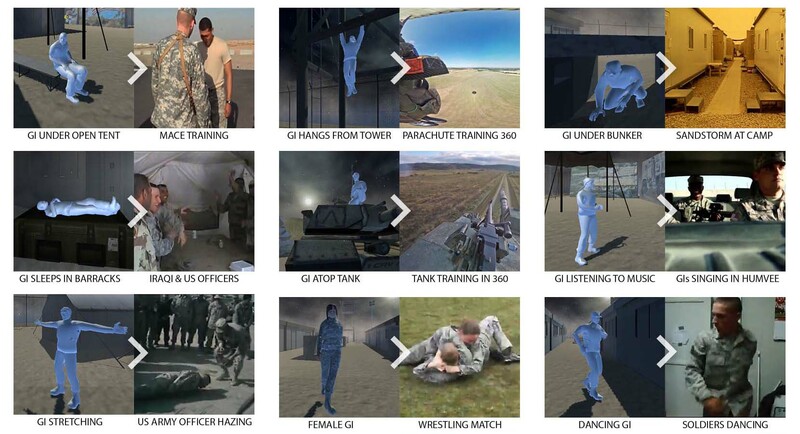 In “Ghosts of Camp X” the real world (cinema) is embedded in the fantasy world (CG). 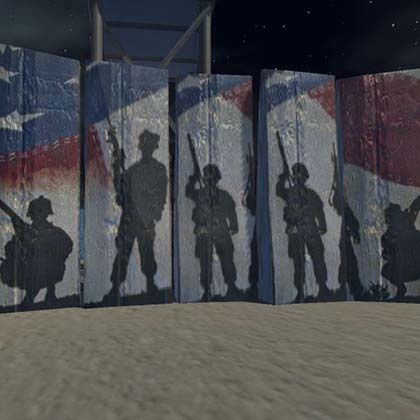 CAMP BUCCA, Iraq (Army News Service, March 9, 2010) — Since Sept. 16, Iraqi civilian and U.S. military deconstruction teams have transformed the landscape surrounding the rusting, chain-link walls of the theatre interment facility here to piles of rubble. That day, the last prisoners of the TIF boarded the detainee air transport north-bound for Camp Cropper, near Baghdad. 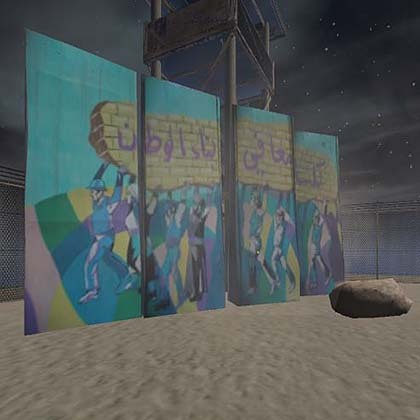 The Camp Bucca detention center, located in United States Division-South near the city of Umm Qasr, was officially shut down. Today it is a ghost town punctuated by splashes of color on the many buildings within the concertina-topped fences. 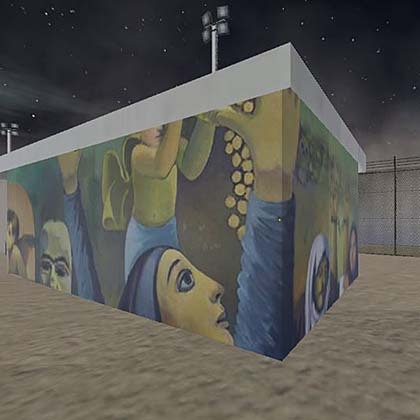 The color comes from nearly five years of detainees putting paint brushes to the outer plywood walls to create hundreds of murals on buildings around the interment facility. 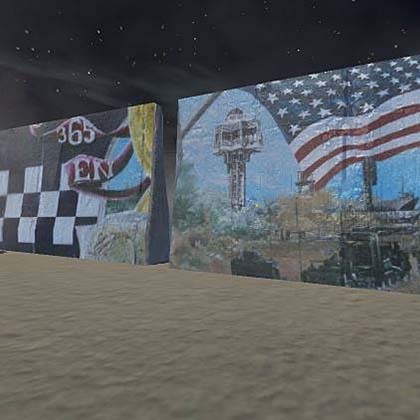 “The detainees painted all of the murals in the compounds and a significant majority of the murals outside,” said Lt. Col. Kenneth King, commander of the 306th Military Police Battalion.